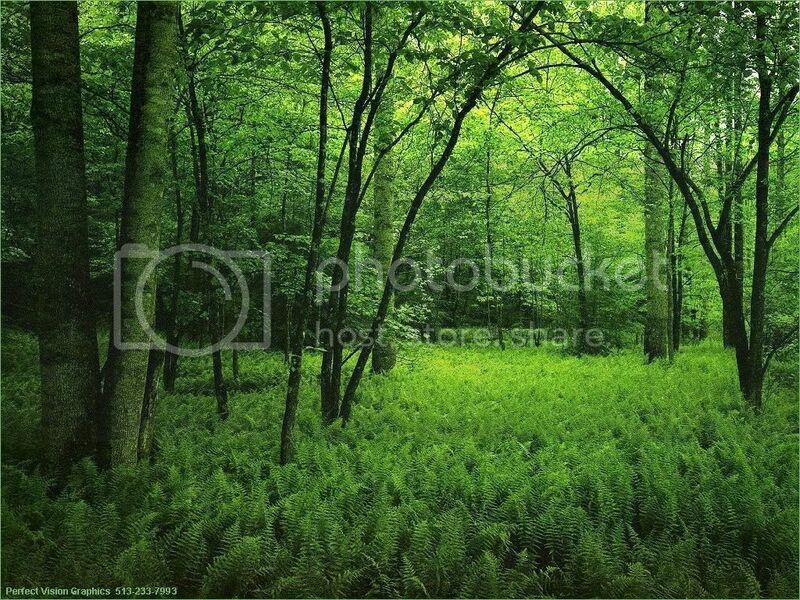 Sunlit ferns stand quietly in a small break within a distant forests floor. Curling tips are a particularly vibrant hue painting the underside and lower portions of this delicate girl. The flash of malachite talons slip from between the fern, a dazzling and deadly display for those with the displeasure of getting to close a look. The fern gives way to the rising sunlit forest as ones gaze climbs from talon towards shoulder. Deciduous leaves paint upwards in thick clusters in a healthy summers' hue. Beneath the foliage there are hints of moss that cling to the supporting trunks. They tease at the sturdy structure which this lady hides beneath smooth curves and sinuous, carefree movements. Arching neck and flaring wings break into the canopy above. Alive in waves of the forests' green, subtle shifts in hue are found as one tree merges into the next upon the broad sails that take her high above such forests in practice. Proportioned head brings the only blaze of color beyond the overwhelming of green in the depth of her eyes. When placid they'll almost disappear in their own contented green and blue, and when not you'll know for the vibrant contrast that give to the rest of her body. Dew kisses eyeridges, neck and tailridges in little emeralds that seem to sparkle as she moves and catches the light just so. Cumulous clouds rise steeply upon the apex of this rather large egg, topped by a few even more dramatic rumbling cumulonimbus. The bottoms of the thunderheads are a dark, ominous gray, but the clouds around that are a light, playful puffy white. The sun appears to be setting, yellows and oranges reflecting along the edges of the columns of cloud. Beneath the weather is not quite as fair, though the blue hue is pleasant to the eye, it blurs where the bits of sky seem to meet a river that winds endlessly about the rest of the shell. A small muddy raft seems to drift within these currents, weathering the storm for wherever it may be taken. The soft weathering upon the shell of the river in the rain egg seems to be taking its toll. Frequent showers rolling across the restless river waters have been slowly, almost invisibly eating at the shell. It shudders ever so slightly the grains of sand which had been sticking to the shell slipping off like watery droplets. River in the rain egg rocks ever more, the waters of time is has been floating through growing suddenly turbulent. The invisible river drawing upon the weakened spots and cracks begin to starburst over the surface. Weakened shell is caught in to turbulent of waters and as though it hits some hidden hazard beneath the rivers raging waves the shell snaps and cracks and falls into hand sized pieces. The eggs inner dragon is released with a roar as mighty as the currents and she springs out of the shards with her vocalization unbroken, landing upon all fours not entirely ungracefully a short span away. The whole of her being in that first cry, it echoes above most other noise even in the amazing din of the caverns chaos. Free! As if the sands are not already hot enough, you feet already feeling on fire it seems as suddenly you are seeing flames. Wavering rippling flames in reds and yellows blur your vision and touch you mind, but the touch is not so scorching as the sands themselves. In fact the touch is pleasant, welcoming, as if you've joined the family's hearth fire and find yourself warmed to your very soul. «Ise, I am Niskath.» You find your vision clearing and the forest green hatchling rather close, maybe too close. Yet somehow it is all so right, as if she's always been there instead of just finding you now as your mind catches up to the present, the lonely uncertainty of your past vanishing into hazy memory and only the warm present and companionable future stretches brightly on your horizon. Niskath is a really pleasant dragon to be around. She's got that sort of warm social charm that relaxes even the most steadfast soul when they come into contact. The best part is there is nothing forced about it, it is just who she is. It is an innate skill that some spend a lifetime and never manage to master. She doesn't feel the need to be the center of attention, but neither is she simply in the background. She is ever a very social dragon. She isn't likely to let you sleep in so that she can sun on her ledge. That would be lonely and boring. No, she wants to be up on the rim, or down by the lake shore, wherever others are gathered. If you let her go off on her own so you can catch a few extra winks you'll find you might have to flag down another ride, or wait til the dragons gossip reaches a lull for her to sociably extract herself to come fetch you. «Surely Ise you know how rude it would be for me to just /leave/. One extra minute or ten to make a proper exit was not that bad now? You are not going to starve catching breakfast a minute or ten late. You've already overslept two hours!» Not necessarily the logic you'll want to always deal with. Weyrlinghood will be an amazing time of discovery for you both. In her very earliest days she'll be very clingy. Her world is you, and you alone and she seems to be a reflection of a self you might not have wanted to see. Lonely, friendless and so desperately wanting, needing another. She needs you. You need her. There's a desperate hungry undying love that grows ever stronger each moment you are together. Of course dragons grow quite quickly and she'll soon discover there is more to her new family. «Who is that?» you feel her question as she cranes her neck to look at Ellezath «Why, it's another me!» being that is another green dragon. Instead of being jealous as some might, she's instead curious and is likely to stumble over. Social graces she'll still need to develop, if ever the innate warm charm is still evident in the first moments as many give her a pass "Well she is still growing. I guess it wasn't /that/ bad" and whew you can let your breath out as you escape the worst of punishments due to the truly innocent nature. "Help clean up that oil she spilled and we'll not worry about the rest. Just have her be more careful next time" Right, better make sure there is no "next time" though. Of flights she'll tend to surprise you. Such a nice bath she just had, how her hide seems to glow with health. The jewel tones within start to just shimmer and then she's flicking her tail and suddenly she's at the rim of the bowl trumpeting and catching a few rays of sun. How nice, you'll feel all warm and fuzzy and that's funny, such an odd group of blues and brown that seem to be taking off, are they playing, no they're… chasing… oh… OH MY! Yup. You're likely to get bemused looks by the group of chaser riders as you clue in to the events of the moment as she sneaks in another flight. She'll very rarely feel the need to blood. When the moment strikes she'll simply take skywards and see who's at the ready. She's flirty and playful with her chasers, climbing high and then diving dramatically, twisting or flaring her wings flamboyantly. Flights are the time when she is the star, she knows it, enjoys it and has fun with it. The ends are often as surprising, which of her crazy antics will end up with her caught in another's embrace? Close call here, near shave there, and oh… well that ends that! Until next time… stay tuned! Ever most importantly now that she is here you have nothing more to be scared of. Never, ever again will you be alone and never does she let the thought even drift close to your mind. Any time your thoughts might drift towards a lonesome time, or the darkness in your past her bright mind is there, blazing away the darkness and surrounding you in a warm embrace of love, undying, unconditional affection to support you inside and out. She is your greatest companion, and through her, the Weyr your extended family. As much devotion to you, you can feel her desire to serve and keep proud to her home, her Igen, your Igen. Niskath's mind voice is sometimes spicier than her general social charm. Warm and pleasantly feminine there won't be any mistake of that. Of a touch she can be a bit dramatic, especially as she gets into a particular topic. Her mindscape is a background of blues riddled with wavering flames. The flames shift in hue depending on the mood and her level of interaction but always stay true to a flames real color from reds, orange and yellows to white and blue. You won't see any odd green or purple flames for instance. Rarely is her touch painful, the flames do not burn, they are the dramatic and flamboyant side of this sociable lady. On occasion one might get hints of citrus as if on the back of the tongue. A mist of unknown origin that tends to dissipate as quickly as one notices it. Blue Blazer roars to life upon the touch of your fingers. Flame ripples along the curling thoughts, vibrant in red, orange and yellow. It arcs dramatically from one side of your mind to the other, never quite touching but ever so much there. Dangerous it sparks with the twist of a bit of lemon through the flame, a bitter edge to an odd flavor which rolls across your tongue. Ever tasted dragon? Dangerous. Dramatic. It leaves as suddenly as it arrives, the flames snuffed out into a sudden darkness and you are left alone again. Blue Blazer returns, anything but subtle as you caress its shell further. Flamboyant flames sizzle and snap, the oranges growing intense one moment, and reds the next. Whispers of blue, deceptive in the heat of its intensity for the color seems ever so cool, slowly enrobe the meandering presence. Still it seems to never be. Your focus here and it will be there, sliding past your concentration with devious laughter until it swoops away into the abyss of its shell. Blue Blazer swirls with the dying blue flames. Their intensity flickers and fades as the drink coalesces into something to not completely savage the throat. How much more interesting it might be to try to drink fire though? The edges of this one's thoughts brush your with dangerous question, a dare unspoken. Not that you should take it to seriously perhaps. If you did then such a foolish one it could never partner, for there is a definitive intelligence that evades you in a subtle game. Still, in parting it rushes your thoughts in a last bold flare of lemon. Both in hue and taste this one leaves as dramatically as it enters. The theme for the eggs of the clutch was Broadway Musicals, and generally the musical theater posters. Her egg is based on the production of Big River. You can find the poster/cover of inspiration here: http://en.wikipedia.org/wiki/File:Big_River.jpg. The mind theme was alcoholic drinks. Blue Blazer is the first flaming cocktail, as published in the first bartenders manual in 1862. It is a simple mix of Scotch whisky and water, set aflame and tossed back and forth a few times. Then sweetened with a little sugar and a served with a twist of lemon peel, but DON'T TRY THIS AT HOME. It is for professionals (and dragons) only! It apparently makes quite a show however, if you ever want to test someone's professional skill at a bar. I found it a fun kick off to a dragon's personality. I hope you enjoy how it has translated with your desired input. As for her description the name is taken from one of the musicals songs, while her physical coloring is inspired from this picture: http://i566.photobucket.com/albums/ss106/miss_anna_chan/Backgrounds/green-forest.jpg. Her name was a bit trickier. I played around with many different variations and finally settled on Niskath. It comes from playing with the translation of "gregarious forest", in this case in Lithuanian (visuomeniskas miskas).